Banff & Buchan MSP Stewart Stevenson will inspect the traffic calming measures put in place in the village of Rora at 2.00pm on Friday 28 April. Mr Stevenson lent his backing to the local Community Association who had been lobbying for measures for some time. The village is situation on an unclassified road but is a popular thoroughfare for traffic coming from the west to the St Fergus Gas Terminal. Among the measures recently installed which residents say have made a difference are new signage, road markings and an electronic speed warning sign. “I am pleased to see these measures in action at first hand and I am delighted to hear from local people that they are making a difference to traffic speed in the village. Banff & Buchan SNP MSP Stewart Stevenson will be getting out and about round four local village halls later this month with his constituency surgeries. Mr Stevenson will be holding his April advice surgeries in the village halls at Forglen, Fordyce, Rora and Longhaven getting out and about in some of the smaller communities in Banff & Buchan as well as generating some revenue for the rural halls with hire costs. “Village halls fulfill an extremely useful social function and it is vital that they are well-used and get the support that they deserve from their community. “I hope that in a small way, by holding my April surgeries in these halls when they might otherwise not have been used, that this will provide a modest income for the halls’ upkeep. I know that Rora Hall, for example, is busy fundraising for a new extension so I look forward to hearing about that when I visit. “While I have my regular summer surgery tour where I call at every town, village and hamlet in the constituency, it is also important to get out and about in communities where I may not otherwise be during the course of the year. Rev Rodger Neilson, Minister of Cruden Parish Church, delivered ‘Time for Reflection’ in the Scottish Parliament this week. Rev Neilson and his wife was welcomed to Parliament by local MSP Stewart Stevenson. The Rev Rodger Neilson (Cruden Parish Church, Aberdeenshire): Those of a Christian faith, not only in our land but throughout the world, have just celebrated Easter. The story of the first Easter is, of course, at the heart of the Christian faith, and what is at the heart has an ultimate importance. When I was spending a few days recently in the heart of Perthshire, a walk on the trail round the Birks of Aberfeldy was a must. While enjoying that walk in the winter sunshine, I recalled something that I read many, many years ago: if a line were drawn from the north-east tip of the Scottish mainland to the south-west and likewise from the north-west to the south-east, those two diagonals would cross each other at Aberfeldy, placing it at the heart of Scotland. I never took out a map of Scotland to trace those lines and check it out for myself. I think that that was because I did not want to find out that it might not be true. I was simply happy to believe that the heart of Scotland was in one of its most beautiful areas, alongside the Tay and not far from the hills around the loch of the same name. If Aberfeldy is at the geographical heart of Scotland, we can go on to say that Scotland has more than one heart, and that can lead us to ask some important questions. What is and what should be at the heart of our Scottish identity? What is and what should be at the heart of our Scottish character? What is and what should be at the heart of our Scottish aspirations for ourselves and for the world? Those questions are not only for politicians to deal with, for they surely should matter to every responsible citizen. I believe that those questions are more easily considered when we are more comfortable with our answers to personal questions. What is and what should be at the heart of my own identity? What are and what should be my own aspirations? What is at the heart has ultimate importance. If we can deal with the questions of motivation and purpose at the personal level, that should make it easier for us to tackle them at the national level and, in turn, as we see more clearly our national destiny, we might find our individual hearts being inspired for the better. The celebration of Easter should motivate the Christian believer to focus more clearly on what is at the heart of his or her faith. Any time is a good time for all of us to reflect on what lies at the heart of our individual, community and national lives. I pray that all of us will take time regularly to do just that. Jack McConnell today came under SNP fire over figures showing nearly 1,000 drug addicts waited more than six months for assessment. And 400 of them waited more than a year, Nicola Sturgeon told MSPs at First Minister's Questions. "Waiting times like these are just not acceptable," said the SNP Holyrood leader, who said the statistics were from official figures supplied to her over the Easter break. The exchanges between Mr McConnell and Ms Sturgeon came after a Holyrood debate on drugs. Nicola Sturgeon began by congratulating Strathclyde Police on a series of dawn raids in Glasgow earlier today and went on to seek Mr McConnell's views on addicts getting access to treatment. Ms Sturgeon acknowledged there had been success in tackling the supply of drugs, and the attempts to improve rehabilitation and treatment. But she said that before addicts could be treated, they had to be assessed. "Information provided to my office during the Easter break by the government statistics department shows that in the last quarter of last year, of the 7,000 new addicts referred for treatment, nearly 1,000 of them waited more than six months just to be assessed. "Four hundred of them waited longer than a year just to be assessed for treatment. "When we have a strategy that rightly encourages addicts to seek help and take personal responsibility for their lives, waiting times like these are just not acceptable." In the Holyrood debate earlier, SNP MSPs argued that relaxing the rules on drug misuse would only make the drugs situation in Scotland worse. SNP MSP Stewart Stevenson said a large study carried out in the Netherlands showed legalising cannabis did not reduce the use of harder drugs. He said the study revealed that Amsterdam, with its relaxed approach to cannabis, had the highest use of not only that drug but also other illegal drugs. Mr Stevenson, Banff and Buchan MSP, said: "There will be some benefit in the sort of approach they take in Amsterdam in police time, but it doesn't touch upon drugs use. "The study that has been done in the Netherlands shows that legalising cannabis actually does not reduce hard drug use." And he stressed the need for various treatment options to be available to help addicts. He said: "There is no one-size-fits-all option, if only there was we would have solved it by now." Maureen Watt, in her maiden speech following her swearing in as a North East Scotland MSP yesterday, called for more residential drugs rehabilitation places and questioned the "controlled drug abuse" of prescribing methadone. Ms Watt said she had witnessed first-hand the "human misery" caused by drugs for the last 14 years as a prison visitor at Craiginches in Aberdeen. And she argued that neither short jail terms nor methadone was the answer for addicts. Ms Watt said: "The benefit to the drug user and society of becoming drug-free greatly outweighs the benefits of controlled drug abuse. "Residential rehabilitation has been shown to be the most effective in facilitating recovery and yet is available to only a tiny proportion of addicts in Scotland. "I agree with colleagues that it is not a case of one-size-fits-all. "The methadone programme alone, for an estimated 20,000 addicts, is at a cost of £12 million. "How much better if this money could be redirected to provide residential rehab services?" Ms Watt said private provision of such programmes was "patchy and unregulated" and called for greater publicly funded residential rehabilitation places. Banff & Buchan MSP Stewart Stevenson has given his backing to Mental Health Action Week, which runs from 16th – 23rd April. “Mental Health Action Week is an annual health campaign that has been running since the 1950s and it is aimed at raising awareness of mental health problems and encouraging people to look after their own mental health. “Around one in ten people is likely to have a disabling anxiety disorder at some stage in their life and an estimated one person in ten has some form of depression at any one time, with it being most common in people aged 25 to 44. In addition, it is estimated that one in 20 people will have serious - or clinical - depression at any one time and by the year 2020, it has been estimated that clinical depression will be second only to chronic heart disease as an international health burden. This is measured by its cause of death, disability, incapacity to work and the medical resources it uses. Banff & Buchan MSP Stewart Stevenson has welcomed a response from Aberdeenshire Council that Memsie is to get electronic speed limit warning signs during the current financial year. The MSP met with local residents and roads officials in Memsie last October to hear first hand of concerns about road safety and speeding traffic. Mr Stevenson accepted a petition signed by a huge number of local residents which he passed to Aberdeenshire Council. Now, in a letter from the Head of Roads, Mr Stevenson has been advised that road markings at the Memsie junction have been refreshed and that arrangements are in hand to install electronic speed warning signs in the village on the B9032, following a traffic survey which confirmed residents’ views that there was a speed problem. “Following the site meeting with residents late last year, Aberdeenshire Council agreed to carry out a survey of traffic speed in response to the concerns expressed. This has confirmed that there is a problem with traffic not observing the 40 mile per hour limit on the B9032. Local MSP Stewart Stevenson is calling on NHS Grampian to emulate the success of midwife-led maternity units in the neighbouring NHS Highland area. In the Skye and Lochalsh area, numbers of births delivered locally has trebled from 2003. According to NHS Highland, more babies are being delivered within the area because of the new-look midwife-led maternity service. Banff & Buchan MSP Stewart Stevenson has urged Education Minister Peter Peacock to review current arrangements for funding school transport which are disadvantaging Aberdeenshire Council. Currently, under the Grant Aided Expenditure (GAE) arrangements for school transport, the Labour/Liberal Scottish Government provides around 45% of the national cost to councils of school transport. However, Aberdeenshire Council only receives around 30% of the £11.5 million which it costs each year to provide school transport, placing it at a considerable disadvantage. “Aberdeenshire Council is, by official measures, one of the most rural areas in the country. It stands to reason therefore that a large sum of money has to be spent on transporting children to school safely. “While the GAE does not totally cover the cost of this to the council, it is unacceptable that Aberdeenshire Council should be receiving around a third less in terms of GAE than the Scottish average. There are examples of councils in other, more urban, areas being better funded for school transport. Local MSP Stewart Stevenson has welcomed the SNP Spring Conference's backing of a resolution to ensure that the Labour and Lib Dem Government implement all contingency plans effectively and efficiently in order to protect the Scottish poultry industry. Conference also showed support for Scottish poultry producers calling on the people of Scotland to show support as consumers by continuing to buy Scottish. "The poultry industry is a very important one to the economy of the North-east and the Scottish Executive must act swiftly to ensure that all existing plans for dealing with the disease in Scotland are quickly implemented. "We must do all we can to not only protect our poultry industry and the wider rural economy, but to reassure the public that there are no immediate public health concerns related to the incident. "That's why I welcome conference's support in order that we can all work together and deal with this situation as efficiently and effectively as possible. We must do all we can to ensure Scottish poultry produce continues to be recognised as among the finest in the world and show our support as Scottish consumers by continuing to buy Scottish." Conference notes the case of bird flu in Fife and calls on the Scottish Government to implement all contingency plans effectively and efficiently in order to protect the Scottish poultry industry. Conference acknowledges the fact that Scottish poultry, eggs and Scottish produce in general is the finest in the world and encourages Scottish consumers and supermarkets to continue to buy Scottish. Banff & Buchan MSP Stewart Stevenson attended today’s meeting of the NHS Grampian Board where Board members were to discuss maternity service provision in the North-east. Mr Stevenson had previously written to all Board members urging them to back local maternity services at their meeting. “The Health Board members had in front of them the Board’s own recommendation to move maternity services away from Fraserburgh so, in that context, I very much welcome the decision today to postpone until June the decision on the future of maternity services. “In the meantime, the consultation process will be referred to the Scottish Health Council for review which, given local unease over the manner in which the Health Board have conducted this, is a sensible move and one which I am sure people in Fraserburgh will welcome. “An interesting point which came out of the meeting was that NHS Grampian’s expenditure exceeds that of Aberdeenshire, Aberdeen City and Moray Councils put together. Yet this is a body which has no democratically accountable link between the Board members and the communities which they serve. Who, for example, is the voice of the people of Fraserburgh on the Health Board? 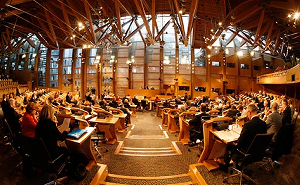 Banff & Buchan MSP Stewart Stevenson has given his backing to World Health Day, which takes place on 7th April. “Health workers - the people who provide health care to those who need it - are the heart of health systems. But around the world, the health workforce is in crisis - a crisis to which no country is entirely immune. The results are evident: clinics with no health workers, hospitals that cannot recruit or keep key staff. There is a chronic global shortage of health workers, as a result of decades of underinvestment in their education, training, salaries, working environment and management. This has led to a severe lack of key skills, rising levels of career switching and early retirement, as well as national and international migration. “There is no single solution to such a complex problem, but ways forward do exist and must now be implemented. For example, some developed countries have put policies in place to stop active recruitment of health workers from severely understaffed countries. Some developing countries have revised their pay scales and introduced non-monetary incentives to retain their workforce and deploy them in rural areas. Education and training procedures have been tailored to countries' specific needs. Community health workers are helping their communities to prevent and treat key diseases. Action must be taken now for results to show in the coming years.